» home » enterprise zones » » die maintenance, at what cost? What are the actual costs for die maintenance in your organization? How do you measure them? And, do you think that die-maintenance costs should increase or decrease over time? Actual die-maintenance costs remain unknown at many organizations because the work performed, die repair, not maintenance, often is intermixed or combined when it comes to cost tracking. As a result, management often sets internal goals to reduce die-maintenance costs. Preventive maintenance consists of formal procedures and tasks that help prevent unplanned breakdowns and ensure that the tooling operates properly. The tasks and time intervals may be determined using owners manuals, industry best practices, technical handbooks, experience with similar processes or even a best guess. Be aware that preventive-maintenance programs can have adverse consequences, such as over-maintenance. An example: a preventive-maintenance schedule that requires punches in a die to be changed or sharpened every 100,000 hits, even though the quality of the punch point has not degraded because, possibly, the stamped material resided at the low end of thickness and tensile-strength specifications. The second condition, under-maintenance, involves failure conditions not identified or corrected in a timely manner, resulting in broken die components. Stamping material at the high end of both thickness and tensile-strength limits may produce more off-center loading in the press, requiring punches to be sharpened more frequently than prescribed in the schedule. Predictive maintenance uses actual equipment-performance data to determine when maintenance should occur, thus improving upon preventive maintenance. Predictive- maintenance tasks include those that can indicate deteriorating conditions or rate-of-decay. With this strategy, in-die load sensors or strain gauges provide periodic or continuous monitoring to detect the onset of wear or degradation at a critical die station, providing information that helps predict potential problems and the best time for maintenance. Note the difference between preventive and predictive maintenance. Though frequently used interchangeably, each term denotes a fundamentally different strategy. Predictive maintenance: event-based, determined through the acquisition of data (e.g., force, temperature, vibration frequency, etc.). Proactive maintenance or reliability-centered maintenance, seeks to improve process performance in addition to maintaining the equipment. It focuses on determining the root causes of maintenance failures and dealing with those issues before problems occur, thereby serving as an extension of predictive maintenance. Rigorous use of proactive maintenance can make maintenance activities profitable. The cost and effectiveness of die repair (reactive maintenance) and preventive-maintenance programs should be tracked separately. When taking this route, manufacturers often find that they spend too little time on preventive maintenance programs. 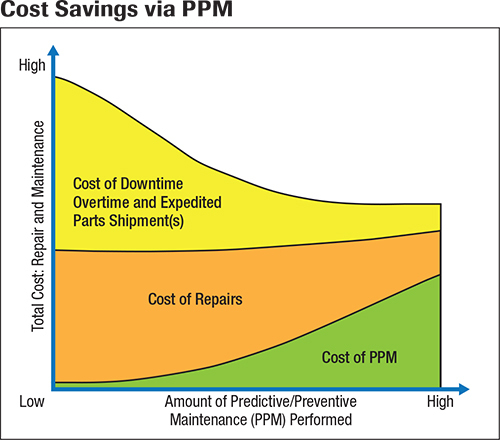 The graph on the previous page, Cost Savings via PPM, illustrates how predictive/preventive maintenance (PPM) can double cost savings. The total cost for die repair, often because PPM is lacking, includes costs for machine downtime, overtime and expedited part shipments to the customer resulting from downtime. So, while increased PPM activity increases maintenance costs, the resulting savings from unexpected failures and related downtime often more than offset those costs.